I know how exactly it feels. I know it wasn’t just a show. And I want you to know that it is okay to grieve what was taken from you. Ignore the people who tell you it is ridiculous to mourn a television series. Issue an indefinite mute button for anyone willing to call you crazy out loud. Even if they happen to be people you love, admire and respect. Truth is, they don’t know crucial information about you. You, my dear beautiful girl, are a whirlwind of valid emotion just looking for a place to touch solid ground. Many will never understand that your safe place to land was your favorite tv show. They have no clue that these characters, this story felt like home to you. It will forever be a secret you hold inside of just how much this show(s) changed your life. It was more than special, I understand. I am a fan too. A fan who waited alongside you for promotional stills to be released and new episodes to air each week. Together we obsessed over that unbelievable cliffhanger and raged against unexpected plot twists. We cried together when our favorite character succeeded or suffered a loss. And then again, when news broke that the show was lost to us forever. I was there. When my favorite tv shows got canceled the ripples carried over with real consequences. 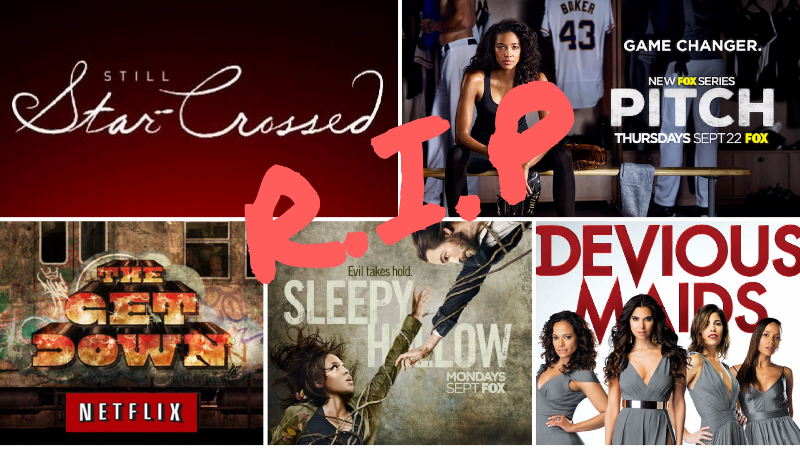 After the death of series like Lincoln Heights, Pitch, Rosewood, Sleepy Hollow, Devious Maids, Still Star-Crossed and so many more I’ve lost count…I spiraled like a tornado with nowhere to go. I got so depressed that I stopped being social because I knew my friends wouldn’t understand. I quit eating normally and sleeping through the night. I read fanfiction constantly and binged episodes continuously as my grades dropped. I even cut my long hair to match my short-haired favorite character because I missed her so much. Then, I switched majors during junior year and again a semester after because I was so unhappy. Only it wasn’t school, it was the show. It was like my favorite tv series brought the world to my fingertips and in an instant, it vanished. I was left a devastated mess destined to relive old memories. To brown girls whose favorite tv shows get canceled, this is what you need to know. We’re allowed to grieve as we see fit. We lived for these shows. We found ourselves inside some characters and fell in love with others. We will not forget them. We couldn’t if we tried. Promise me, that you will harness the hurt you have. Be so heartbroken, so frustrated, so angry by the cancellation of your favorite show that you become inspired to create one yourself. Write a new show with characters that feel comfortable like your old favorites. Produce it with friends that obsess over TV like you. Direct it using a smartphone. Make a new home. This new home you fashion out of every show you’ve ever loved, the world can’t take from you.